It seems fitting to discuss endings as our class draws to a close. For this last homework assignment, please consider the importance of endings to films and discuss one of your favorite endings. Note how the ending to Truffaut’s 400 Blows ended with the freeze frame of Antoine facing the camera, an ending that is intentionally ambiguous, forcing the viewer to continue the story. The ending to Truffaut’s film is so iconic that it is frequently quoted or parodied. See this short clip that shows how Truffaut’s ending was used for the final shot of Nelson’s film in a Simpsons episode. To complete this homework assignment, please submit your favorite endings in a comment. Homework #10 is DUE by Tuesday December 15th (2 days BEFORE the in-class Final Exam). Everyone should submit a COMMENT to my post. The science fiction film “La Jatee” is a post-apocalyptic documentary from the future. The audience follows the journey through a set of images and narration. The protagonist is a man who is sent back and fourth in time to somehow save the world. The man then pursues a woman only to witness his own death. Time travel films are the best but they are very hard to follow because time travel is very complex. My favorite time travel film is “Looper” a very underrated film with Bruce Willis and Gordon Levitt. The film takes place in the future in which, time-travel exists but is only available for the rich in the black market. Mobsters put hits on people and send them to the past in which a hit man knowns as a “looper lies” kills the target. Everything goes well until the hit man ends up killing there own future selfs or ends up being hunted known as a “closed the loop”. The hit man can never know who they kill because the target always wears a sack on there head. If the target get’s away the hit man is dead and is hunted. One day the main character Joe is sent to kill a man without a sack only to realize the man, is his future self and escapes from him. In 1962, Chris Marker released an experimental film that he described as a “photo roman” (a photo novel), which was comprised of editing together individual photographic stills rather than film shots. 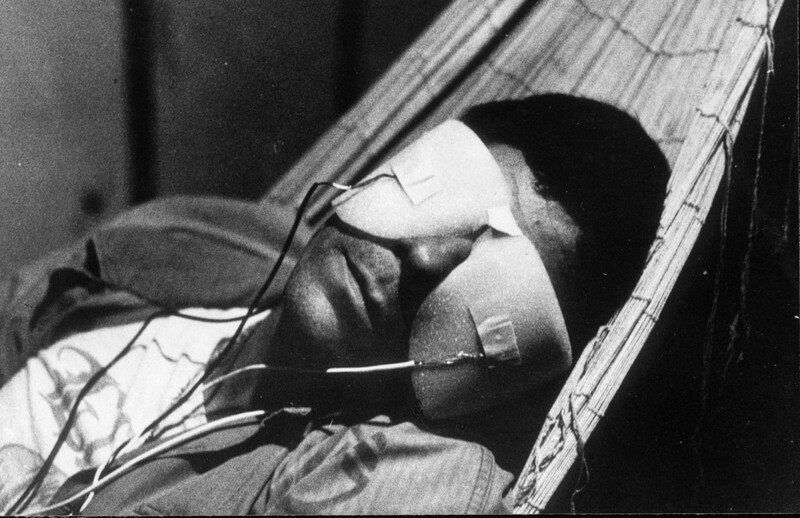 The result was La Jetée, a groundbreaking short film of science fiction about time travel in a post-apocalyptic world. Marker’s film inspired Terry Gilliam’s 12 Monkeys (1995) and a recent TV series of the same name. Watch Marker’s film (it is 28 min) and the trailer of Gilliam’s movie, and discuss the use of cinematic time travel. Is it successful in La Jetée? What movies have you seen that deal with time travel? Watch the trailer of Terry Gilliam’s 12 Monkeys here. Homework #9 is DUE by Tuesday December 8th. Clubs and Hearts Post, Diamonds and Spades Comment. 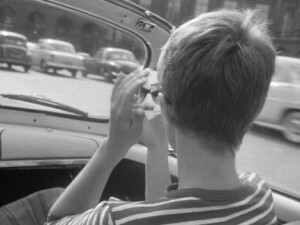 Jean-Luc Godard’s extensive use of jump cuts in Breathless (À bout de souffle) 1960 was highly influential on the “look” of many later films. In a jump cut, two shots of the same subject differ in angle or composition, the disjuncture creates a visual “jump” on the screen. The jump cut is an example of discontinuous editing, however, the uneven transition of one shot to another is often described as an amateurish technique. Yet, Godard masterfully uses the jump cut to highlight the urban rhythm of Paris and the whirlwind pace of modern romance. Watch this clip, in which Michel (Jean Paul Belmondo) gives Patricia (Jean Seberg) a ride across town to her appointment. Note the number of jump cuts in the car sequence, in particular, the change in backdrop that frames Patricia’s head. For this week’s homework, please search for the use of jump cuts in a later film. You can watch clips of a movie you like to see whether jump cuts are used, or simply “google” jump cuts. Post a link to the film you’ve found and describe the impact of the jump cuts in that film clip. Watch the car sequence in Breathless here. To complete this homework assignment, note whether you Post or Comment. For Homework #8, Diamonds and Spades Post and Clubs and Hearts Comment (choose any of your classmates’ posts to comment on). I searched online for some films that included some examples of jump cuts, unsurprisingly, I found numerous links to the movie “Breathless,” and some I’ve never heard of. However I found a link to a scene in the movie of “The Royal Tenenbaums” which I really liked for the reason being it didn’t contain dialogue, but you could merely appreciate the physical aspect of it. (I didn’t notice that another student posted the same movie until I was done with my post.) Being that I hadn’t watched it before, I initially thought that this scene was merely depicting someone giving himself a makeover, albeit it truly depicts not only a physical transformation, but a mental transformation. The use of the jump cut in this scene firstly allows the viewer to focus on the time aspect of the scene, the scene is not supposed to be five minutes, but it gives the viewer an impression that the scene lasts for longer than is showed. Secondly, by giving you shots of the film back to back, you can see that Richie Tenenbaum goes through multiple different looks and attitudes before he finally decides to commit suicide. When he does slit his wrists, and one of the kids discover him lying on the floor, there is another jump cut to him on a bed with nurses rushing him down a hall, building. This last cut builds suspense for the the next scene. Fan dissecting films are very interesting. I liked how he showed each location with split screen. The top showed how it looked in the actual movie, and the bottom showed what the locations look like in the present. Even though fan dissecting is interesting, I’m not really a big fan of them. They’re cool, but I rather see the actual movie. At the special features section in DVDs sometimes I’m interesting in seeing certain things, but a fan dissecting is not one of them. An example, is a director narrating or how certain great scenes are made. For the Bourne Ultimatum I saw how one of the fight scenes were made and that was very entertaining. Jump-cuts in a film is defined as an unexpected change that generally follows a sequence in a clip, that happens to make a person or thing jump from one state or condition to another, without breaking it’s focus. A film that I choose to talk about will be A Space Odyssey;1968. In this short clip you will see a perfect example of jump-cut ; looking from the 33 seconds to the last 45 seconds you’ll see how film jumps back and forth without breaking focus. This part of the clip you’ll see a ship going into space and the globe disappear for a short moment but it comes right back as the ship comes back. You begin to see the sequential jump from one place to another. With the link I provide below you’ll be able to see an example of jump-cut. I find “fan” movies like Attia’s, that deconstruct films and revisit locations, interesting. I say interesting because these movies dissect films and give other fans of the movie a different perspective of the film and where it was made. I’m the kind of person who watches all the “bonus features” on the DVD menu when I see a movie at home. So I enjoy learning the ins and outs to how a film was created and put together. I have been on a tour where they show the locations scenes from my favorite show were filmed. So fan movies interest me, especially when its a fan’s take on a film I’ve already enjoyed. 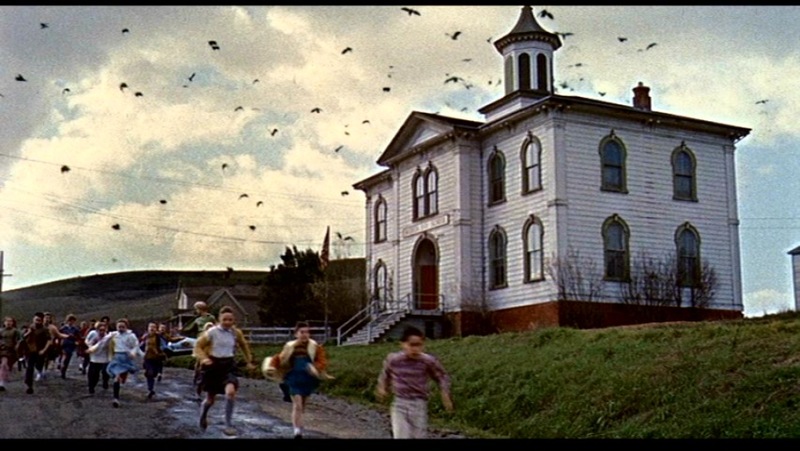 In Alfred Hitchcock’s The Birds (1963), a beautiful socialite Melanie Daniels (played by Tippi Hedren in her first film role) takes a trip from San Francisco to Bodega Bay in pursuit of Mitch Brenner (Rod Taylor). Although Hitchcock preferred to film on a studio set, there are numerous location shots that highlight his love for San Francisco and the surrounding area. As a hobby, the California architect Hervé Attia produced a film short that revisits many of Hitchcock’s locations for The Birds. Watch Attia’s short film and a clip of the attack on the children scene. What do you think of “fan” movies like Attia’s that deconstruct films and revisit locations? Watch Attia’s film location video here. Watch the attack on the children sequence here. Homework #7 is DUE by Tuesday November 17. Clubs and Hearts s Post, Diamonds and Spade Comment, note your blog group! Please email me if you forget which group you belong in.